Soprano Ana María Martínez took a rather unfortunate tumble last week - into the orchestra pit. The Puerto Rican soprano, who was singing the title role in Antonín Dvorak's Rusalka at Glyndebourne, was nearing the end of the opera's first act, when, in a dramatic flourish, she pulled away tenor Brandon Jovanovich, who plays the prince. Ms Martínez's feet became entangled in some of the stage props and she struggled to keep her balance before falling backwards into the orchestra's strings section. According to the Telegraph.co.uk, two medics came forward to help her after Glyndebourne's management asked "is there a Doctor in the house?" The audience was then asked to leave the auditorium and the performance went into its scheduled 20-minute intermission. During what ended up as an extended intermission, Natasha Jouhl, Ms Martínez's understudy, was asked to step up from her role as the First Nymph to play the lead. However, Ms Jouhl's understudy, Natalya Romaniw, was in London when the accident happened, and rushed to catch a train down to Lewes in time for the third act, when the First Nymph sings. Now, a little tidbit that comes to us from Playbill.com: Tony Award winner Kristin Chenoweth duets with Grammy Award-winning violinist Joshua Bell on his new CD, "At Home with Friends," which is due in stores on the Sony Classical label Sept. 29. The former Wicked star performs the classic Rodgers and Hart ballad "My Funny Valentine," accompanied by Bell. The new disc of instrumental and vocal duets also features guest appearances by Sting, Marvin Hamlisch, Nathan Gunn and Josh Groban, among others. Women opera singers still carrying extra weight around had best get with the program. This is the age of the stage director -- a growing number of whom are coming from the film world – and thin is in. Now, in my view this is a terribly unclassy article. 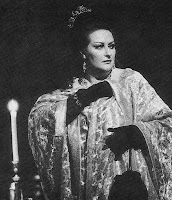 If de Niese wants to discuss unprofessional behavior, perhaps she should re-think being associated with an article that prejoratively applies today's whispy standards to the operatic greats of the past. "Three of them together would fit inside the voluminous costumes once worn by great singers such as [Dame] Joan Sutherland and Montserrat Caballé" ... "We could not go on being elephants on stage." It's just wrong on so many levels. These "elephants", as de Niese seems to call them, not only had voices double or triple the size of the anemic voices that we hear today, but also had a longevity of career that we no longer see. Of course, the reason is not because these singers seemed overweight - as clearly, fat doesn't make noise. But rather, these old school divas spent more time on their craft and less time worrying about what they ate, whether they went to the gym, or whether they were able to fit into the little black dress. And, might I add, they certainly spent far less time trashing the prima donnas of the past ... Elephants? Seriously? As soon as yours truly sees the true quote, you can rest assured this post will be updated.